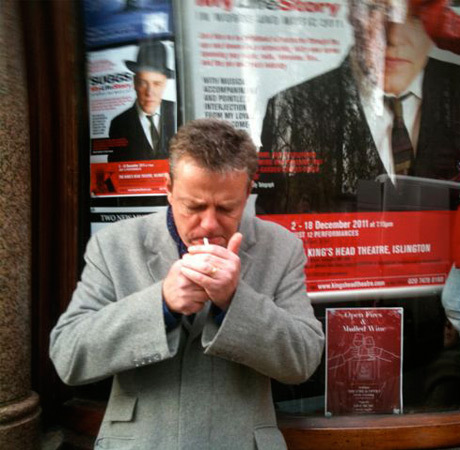 In Suggs: My Life Story in Words and Music, Graham McPherson, the frontman of the seven-piece ska pop ensemble Madness and sometime DJ and television host, takes to the stage in an amusing, and a times moving, theatrical solo show that combines elements of comedy, a play and music hall. Suggs’ performance feeds of his willingness to open up and his no-holds, tongue-in-cheek approach to story telling, whose starting point is the demise of his father, a man he hardly knew. We are catapulted back to the grime of the streets of 1970ies Soho, his acent to rockstardom and entertained by insider stories that shed light on what really happened behind the surface. Underlined and accentuated with the musical emissions and uncalled for interjections by his sidekick Deano, Suggs reminisces, tells funny anecdotes and performs cover versions and stripped down renditions of his own emissions. McPherson’s charisma along with his experience as a performer and raconteur carries the autobiographical monologue along and makes it an engaging show, which is in essence an intimate memoir with an emphasis on personal revelations. McPherson’s reflective, self-deprecating, often ironic yet never sarcastic take on things and his cheeky swagger lend the stories authenticity. His anecdotes are well-paced / phrased, calibrated to circumvent nostalgia and sentimentality and his punchlines are delivered with the timing of a seasoned standup. Suggs: My Life Story is a theatrical companion piece to the Madness shows, who are currently touring Australia, and while ample references are made to the constituents of his outfit, being a connoisseur of the band is not a prerequisite for having an enjoyable evening with the insights of Suggs. My Life Story in Words and Music will be in Perth at the Astor Theatre on Saturday April 22 and in Melbourne at the Comedy Theatre on Monday April 24.